I’ve never watched the film, Monty Python and the Holy Grail. But I know about the famous scene where the Dark Knight, having lost both arms (and later, both legs) to King Arthur’s sword, vows to fight on while stoically exclaiming that “it’s only a flesh wound“. 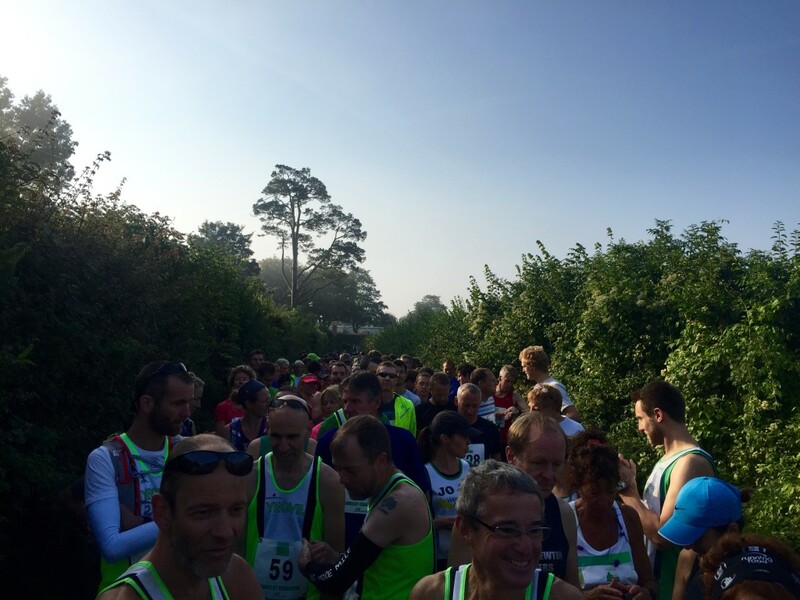 After my experience last Saturday on the “Camelot Challenge” cross-country half marathon, I now have an inkling of what it’s like to suffer at the hands of King Arthur. 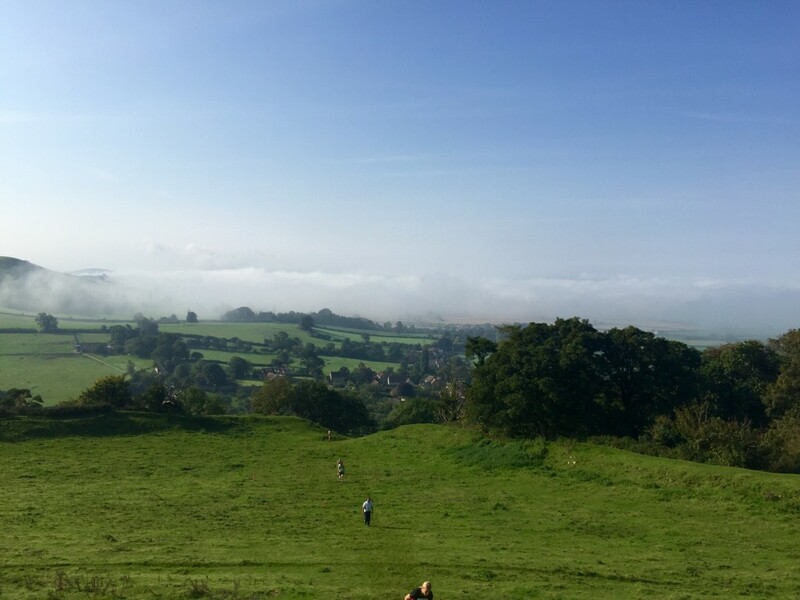 About half way round, as I slowly climbed the hillside of Cadbury Castle (the legendary king’s supposed home), I felt like he had won – with heavy legs, a throbbing hamstring and exhaustion setting in, there was no way I was going to make it to the finish, especially as there were more long climbs to come. 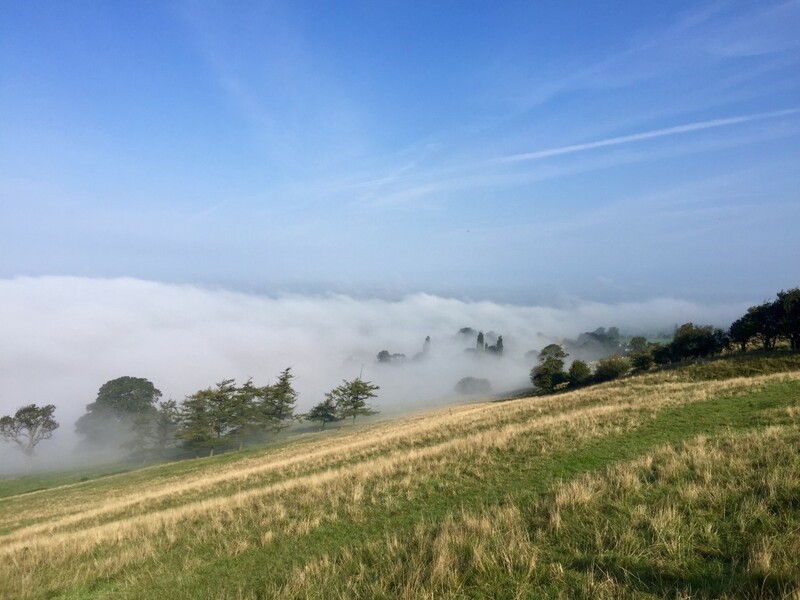 However, when I finally reached the plateau at the top of the ancient hill fort, not even managing a smile or a wave for the photographer who was waiting on the brow of the hill, my attitude changed. Maybe I could carry on a few more miles. Maybe I wasn’t as tired as I felt. Maybe this was just the runner’s equivalent of a flesh wound. Whether this was down to the blood rushing to my head after the steep climb, the amazing views over north-west Dorset and the Somerset levels or the shouts of encouragement from fellow runners, I don’t know. But, before I had time to feel sorry for myself, I was running back down the other side of the hill and looking forward to some water at the next hydration stop at the Camelot pub in the village below. To be fair, my preparation for the race wasn’t by the book. I spent the preceding week on holiday in Cornwall consuming fish and chips, pasties, cheese, fry ups, beer and wine. Plus, I’d only managed a handful of training runs. That said, I was feeling surprisingly spritely when I arrived at the Gryphon School in Sherborne to collect my race number on the morning of the event and meet Hench, who was also taking part. Registration was quick and well-organised despite an influx of people about 25 minutes before the 9am start time. Then, after another quick glance of the map of the route, Hench and I headed over to the start line on Redhole Lane. People were walking the route as well – they had the added advantage of being able to stop in the pub for a cider mid-way round. Some competitors were doing the course with dogs and I was amazed by some of the canine-related running kit on offer. 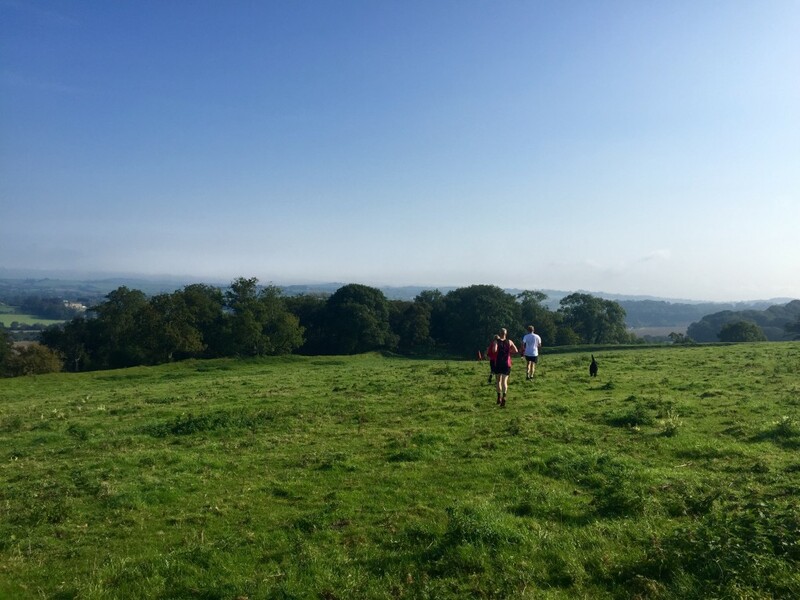 Not that I could ever do a race like this with my border terrier Tilly – she’d be stopping every few yards for a sniff and to mark her territory. A little after nine, the starting horn sounded and we were off. The hill start wasn’t welcome but it was nice to know we’d be running down this stretch to the finish. 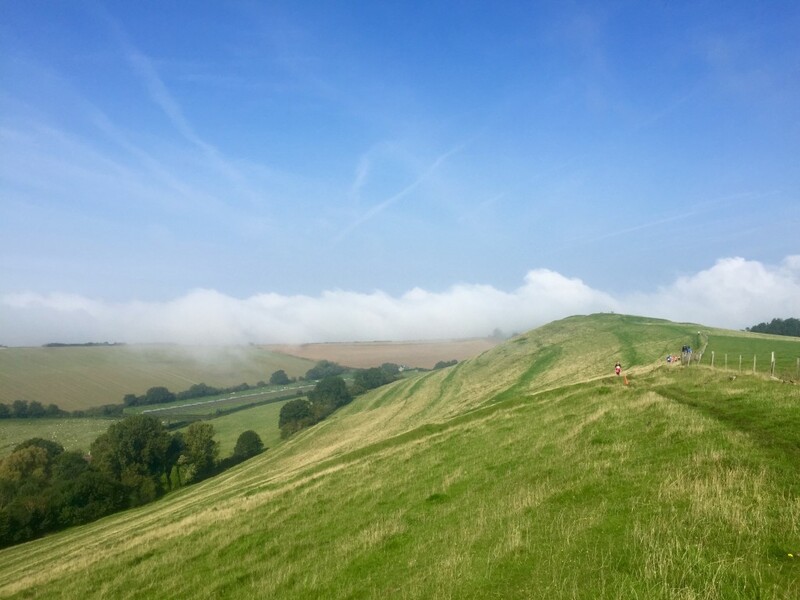 Anyway, there were much bigger hills lurking – my running app helpfully informed me that I’d be climbing 2317 feet (706 metres) today. The first part of the race to the quaint village of Sandford Orcas was on tarmac. This gave most of the field the chance to overtake me before we went off road. At this point, a black labrador decided it had had enough and belly flopped into a large muddy puddle. It was a good move, I thought. We got our first taste of off-roading as we cut across behind some nice-looking gardens as we entered the village. 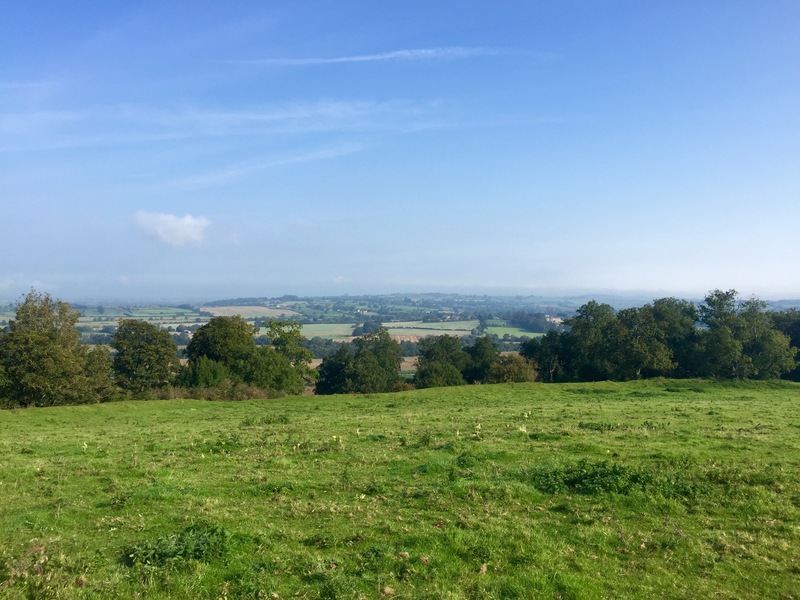 Then it was through a picturesque valley along a stretch of the appropriately named Monarch’s Way – a long footpath that follows the route King Charles II took to escape after he was defeated in the final battle of the English Civil War. I hadn’t really noticed the mist and fog until now – the silhouettes of other competitors faded in and out of view while the sun shone brightly overhead. Oh, and I managed to slip over and get covered in mud. 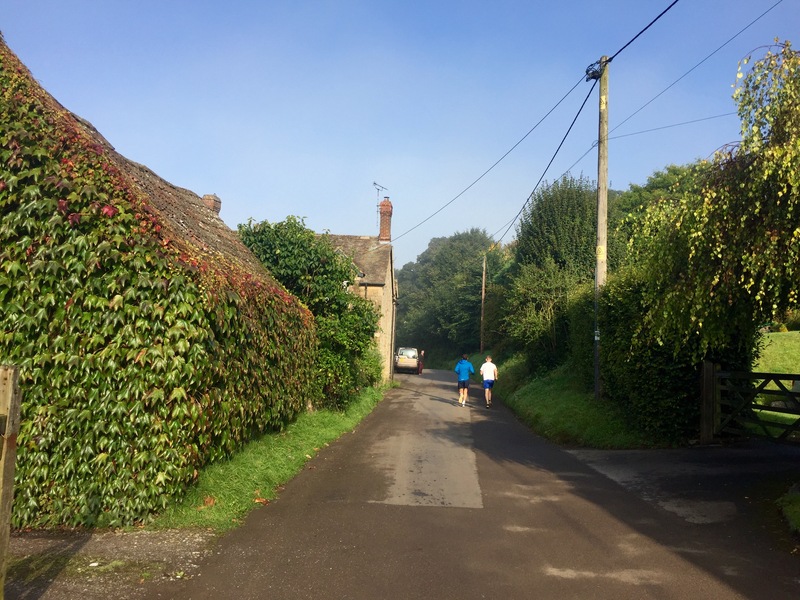 After our first water stop, the route headed up a track to Corton Ridge on the west side of the village of Corton Denham. Here I nipped into the entrance of a quiet track for a visit to the little boys’ room (I’d drank far too much water earlier). Unfortunately, the lad behind me thought this was part of the route and followed me. So, I wasn’t as discreet as I wanted to be. The course was well marked overall though, with signs and red flags highlighting where to go. The organisers had also highlighted badger holes where possible. A few competitors did get temporarily lost. But they corrected themselves after shouts and whistles from those behind them. After the descending Parrock Hill into the foggy landscape below we ran through an orchard, teeming with trees heavy with bright red apples, in the village of Sutton Montis. 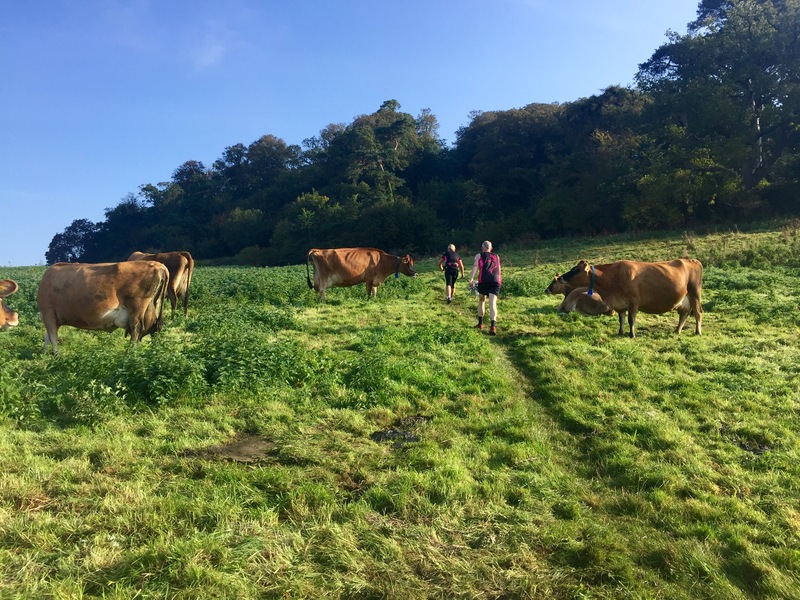 Then came the steep climb – avoiding the cows – up to Cadbury Castle. 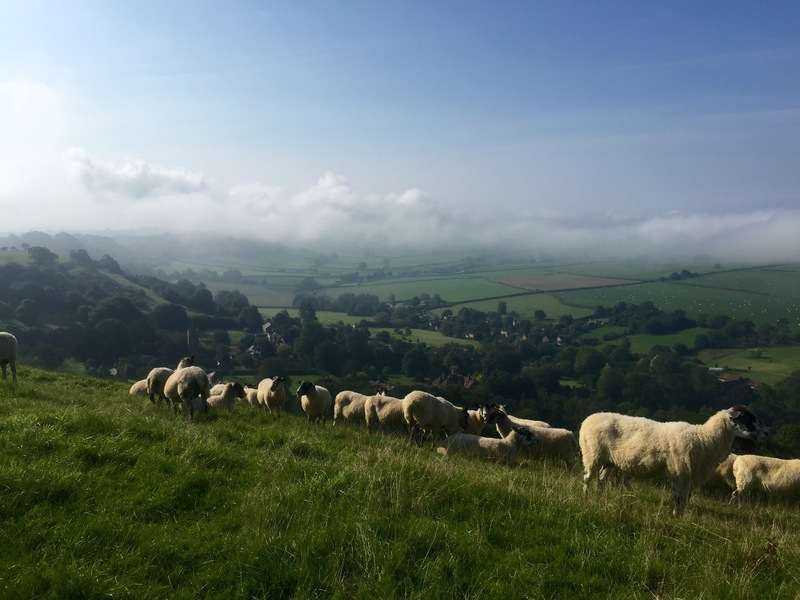 After my rejuvenation at the summit and much-needed water at South Cadbury there was another short climb before we cut across some fields to the medieval village of Whitcombe – nothing more than a few farm buildings in present times. I shared out some of the sweets I’d sneaked into my bum bag. 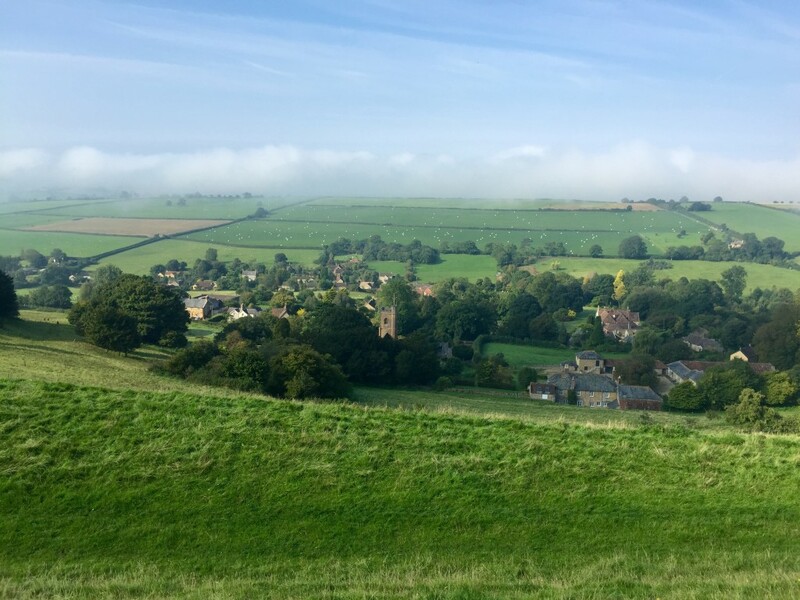 At the top of the hill, we turned left before we reached the beacon itself so we didn’t get another chance to take in the views back over Cadbury Castle, Glastonbry Tor and beyond. 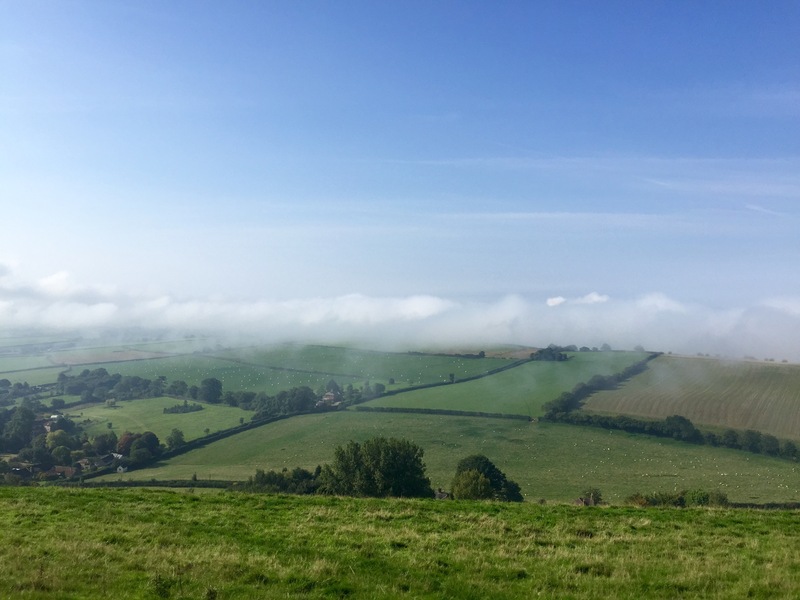 Instead, we glimpsed Corton Denham’s church tower poking out of the village with another blanket of fog providing the backdrop. The hill down to the village was steep and I had to be careful not to lose my footing. The route then continued along another stretch of the Monarch’s Way to the hamlet of Holway, where some friendly llamas waited by the fence to greet us as we ran past. By now, I was struggling again but I was on the final stretch. 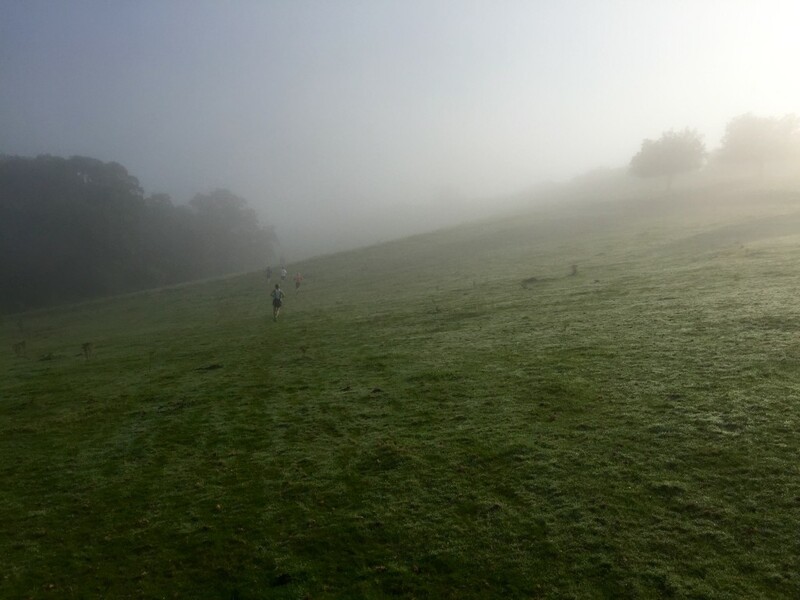 The 12-mile mark was in some woods on yet another upward slope on the fringes of Sherborne Golf Club. 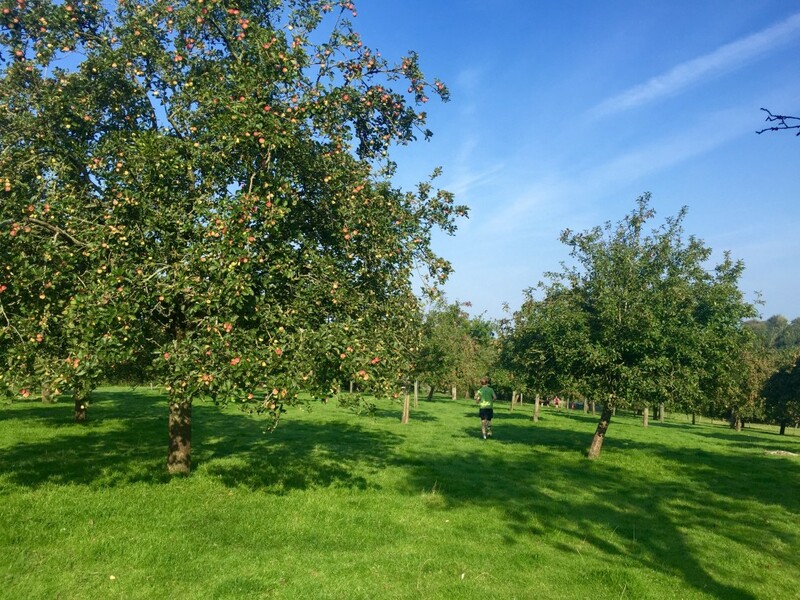 Then followed what seemed like the longest mile I’ve ever ran – the “home straight” back along Redhole Lane felt never-ending. Finally, suddenly, the finish line came into view and that was it – done. I ended up completing the race in two hours and 21 minutes, in 54th place. I was just glad to complete the course, but I later noted that four dogs competed the route ahead of me! Hot soup, rolls and an amazing array of homemade cakes greeted us when we arrived back at the registration point. Hench was waiting too – he’d finished in sixth place so had been hanging around a while. I’ll definitely be doing the Camelot Challenge again next year. 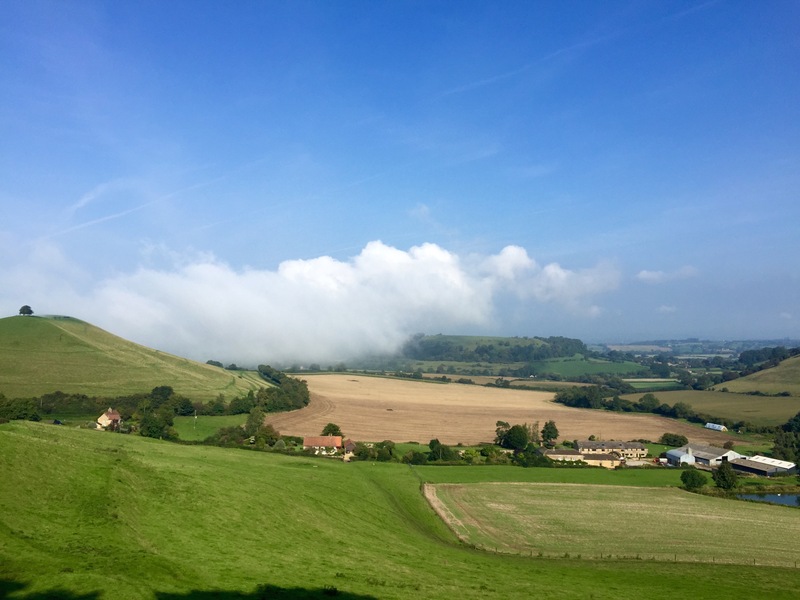 It’s a well-organised event with an amazing route that showcases the beauty of the landscape in this part of the world and a friendly, encouraging bunch of competitors. Dare I say, it’s fun too, despite the pain that King Arthur forced upon me. Info: The Camelot Challenge is on 17 September in 2016, starting at The Gryphon School, Bristol Road, Sherborne, Dorset, DT9 4EQ. You can enter on the Eventbrite website. Was nice to read your lovely raport from Camelot Challenge. This year will be my debiut in half marathon. I’m little nervous,but after I seeing your photos I’m sure that I’ll have a nice time there and I hope I can do it! Glad to hear it, it’s a great route! I’m doing it again this year.